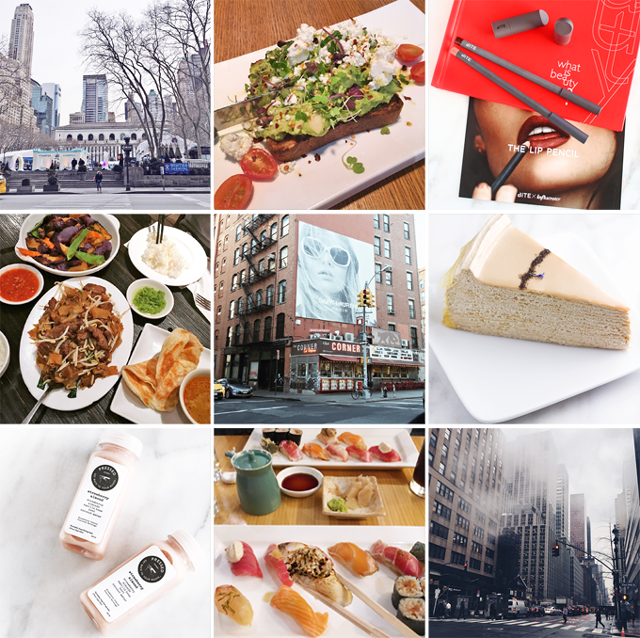 A few highlights of the past month as seen on Instagram which serves as my unofficial food diary and love letter to NYC. I also post quick reviews here and there and try to keep my content unique so it's not a bunch of photos from here. You can see more on Instagram and do follow if you like what you see... Happy March everyone! Bryant Park still looking pretty in the midst of winter. I have a slight obsession with avocado toast and Gotan makes one of the best in the city! Their coffee is also supposed to be great but I can't attest to it since I don't drink coffee. I got to try Bite Beauty's new lip pencils courtesy of Influenster. Check out my mini review to see what I thought. A mini feast at West New Malaysia that also included Hainese chicken. I always try order dishes that I don't make at home when we eat Asian food out. La Esquina Taqueria has such a cool looking facade. They make some amazing Mexican corn there. This seasonal Lady M Earl Grey Mille Crepe Cake has to be one of the refined and delicious cakes I've ever had. I actually ate five bites of it and I usually limit myself to no more two or three when it comes to sweets. Pressed Juicery's limited edition Strawberry Almond flavor is really good. One of the things I love most about NYC is that each neighborhood can have such a different energy. I had sushi for my birthday as well, but from a take-away so I could spend the evening with the kids. Bryant park does look lovely. I always enjoy your photos from NY. I didn't use to be a fan of Winter but now I see the beauty in it. This morning I'm feeling a bit down but not because of the rain and the cold, but because someone actually broke in our basement. They didn't take anything away because there is nothing valuable to take away, but I'm so tired of all the robberies that happen all the time. On the brighter note, that cake does look delicious. I cut off sugar completely for a week or so, because I get carried away with baking for Vday:) and right now I'm back on my moderate sugar intake path:) so I might order a slice of that if I get the chance. Btw I also love to limit myself when it comes to cooking. I think it brings out creativity in us, plus that way we make sure that we empty the fringe...using food we bought is both environment friendly and economical thing to do. And now, I'm dying to try that crepe cake and make an avocado toast. Your pics are awesome as always, but bad for my appetite, Rowena....bwahaha! I've never had avocado toast. I feel like a slacker in that dept! Happy belated birthday, Rowena and many happy returns of the day. All that food looks so tasty. And I love the last amazing pic of NYC. Beautiful pics, as usual... I love sushi! My eyes went straight to that piece of cake. Looks delicious! Avocado toast is so good! Beautiful pictures. I'm drawn to the picture of the cake. I have to try Sushi of Gari some time! I'm getting hungry looking at those roti pictures again too, lol. I don't indulge in sweets too often either, but that cake looks yummy! I love your Instagram recap. Who doesn't have an obsession with avocado toast? I love this stuff but hate making me own because it's hard to judge when the avocados are right! I love pressed juice! Those sound amazing. Loved the Bite Beauty review. Wow seems like a great IG feed, Rowena! Hmmm ... do I follow you on Instagram? Whooaaa let me check ... hope to keep in touch with you too on Instagram. 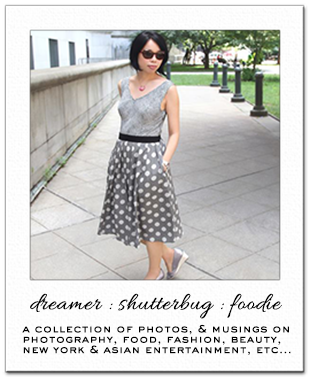 :) Lovely to keep up with you and long time blogger friends though IG as well.